Comfortable apartments at skiing and hiking region Mt. Kronplatz, sunbathing lawn & countless activities in the environs – ideal for active travellers and families! 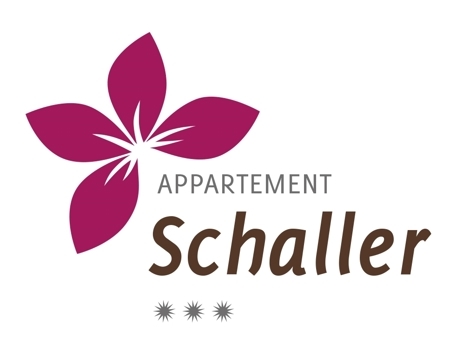 Welcome to Apartments Schaller in Stefansdorf! Our house is located in Stefansdorf, an idyllic district of St. Lorenzen, next to the town of Bruneck. Enjoy the wonderful panorama far away from the hustle and bustle, but at the same time in a favorable location. Among other things we offer a pleasant garden with sunbathing lawn and a storeroom for sport equipment. The holiday flats are on the second floor and they are furnished with loving care. Two of the four apartments are oriented to the south and very sunny. The other two are oriented to the north and have a wonderful view to the mountains. The furnishings include a fully equipped kitchenette, balcony, satellite TV, radio, sofa bed, double or shared bedroom with safe, bathroom with shower, toilet and bidet. Moreover you’ll find a double room with anteroom, fridge, satellite TV, safe and bathroom. This guestroom can be leased separately with breakfast or in addition to an apartment. 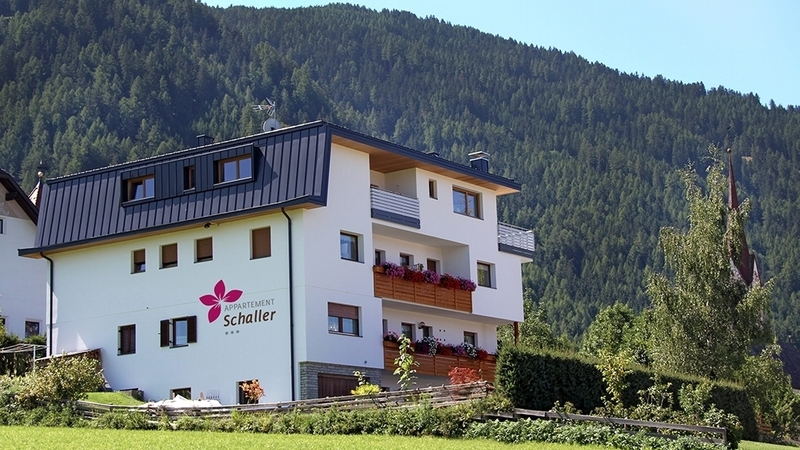 In winter the apartment house Schaller is located only 1 km from the famous skiing area Kronplatz. Other exciting leisure time activities are the skiing carousel Sellaronda, cross-country skiing, tobogganing and ice skating. In summer you can enjoy the sun for instance on our sunbathing lawn. Of course there are available also many marvelous hiking and biking trails, tennis courts, stud farms, a golf course, a swimming pool and more. The holiday apartment have a fully equipped kitchen-living room with a balcony, satellite TV, radio and double sofa- bed. A double bedroom with safe, bathroom with shower, WC and bidet. The living space is very bright with lots of natural light - he can be darkened by blind and thick curtains for optimally sleeping. This apartment are north facing with magnificent alpine views - in summer also you can enjoy the sundown on the balcony. By the window eastward in the living space and bedroom you have a nice view to High Pustertal Valley and the valley station of Kronplatz. Free WIFI. The holiday apartment have a fully equipped kitchen-living room with a balcony, satellite TV, radio and double sofa- bed. A triple bedroom with safe, bathroom with shower, WC and bidet. The living space is very bright with lots of natural light - he can be darkened by blind and thick curtains for optimally sleeping. This flat has a pleasant atmosphere because it's south facing, getting a whole day of sunshine. Here you can fill up a lot of sun in the balcony and look by the way in the direction of Kronplatz. Free WIFI. The holiday apartment have a fully equipped kitchen-living room with a balcony, satellite TV, radio and sofa- bed for one person. A triple bedroom with safe, bathroom with shower, WC and bidet. The living space is very bright with lots of natural light - he can be darkened by blind and thick curtains for optimally sleeping. This flat has a pleasant atmosphere because it's south facing, getting a whole day of sunshine. Here you can fill up a lot of sun in the balcony and look by the way in the direction of Kronplatz. Free WIFI. The holiday apartment have a fully equipped kitchen-living room with a balcony, satellite TV, radio and double sofa- bed. A triple bedroom with safe, bathroom with shower, WC and bidet. The living space is very bright with lots of natural light - he can be darkened by blind and thick curtains for optimally sleeping. This apartment are north facing with magnificent alpine views - in summer also you can enjoy the sundown on the balcony. By the window westward in the living space and bedroom you have a nice view to Down Pustertal Valley. Free WIFI.